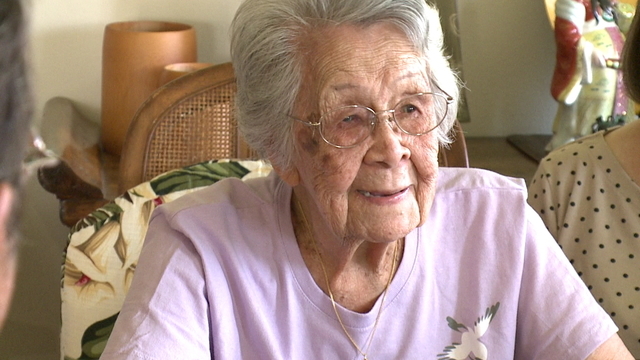 We’re always on the hunt for advice from people who have been there, done that—like this story from KHON2 about a 105-year-old Hawaiian woman who shares her advice for how to live a long and happy life. To say Beatrice Wong is a live wire is an understatement. Wong was born on March 17, 1913 on Hawaii Island. Her father died when she was only 3 years old, and she and her three siblings were raised by their mother. “Go up the mountain, carry wood, carry water every day, go to the well and get the water out. We work hard small time,” she said. In 1936, she married Henry Wong and together they raised four children. Henry died 42 years ago, and like her mom, Beatrice never remarried. Besides four children, the woman referred lovingly to as Popo has 13 grandchildren, 22 great-grandchildren and three great-great-grandchildren. “Five generations and she’s the one that’s held everybody together,” said her son, Larry Wong. Wong is witty and loves to have a good time. She still does word find puzzles, reads the newspaper and watches game shows and the morning news. Former President Barack Obama sent her a congratulatory memo for her 100th birthday celebration, and we featured her on Wake Up 2day when she celebrated her 103rd birthday. Recently, she celebrated her 105th birthday, always smiling, always looking to make people laugh.